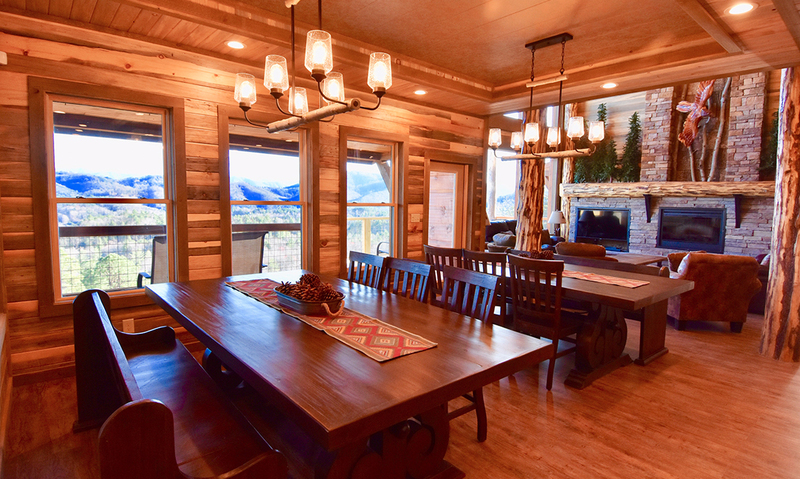 This new build for 2019 promises to be spectacular, with floor-to ceiling windows that bring the beauty of nature inside, unique wood interiors, and plenty of space and amenities for everyone in your group to enjoy and be comfortable. 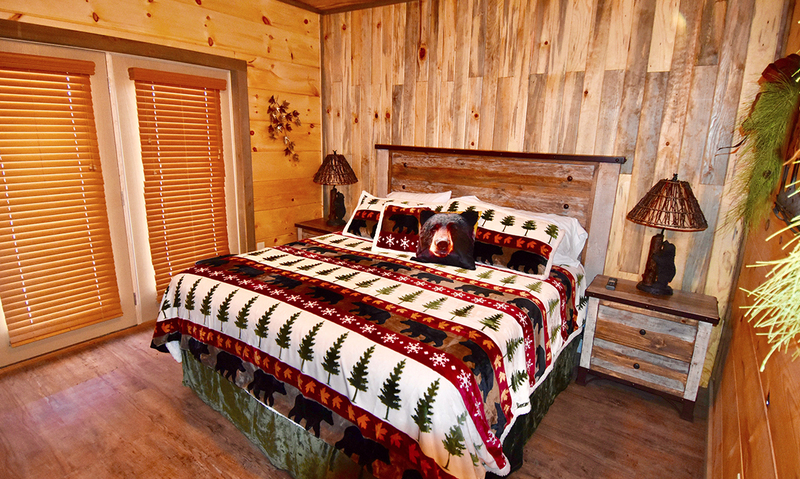 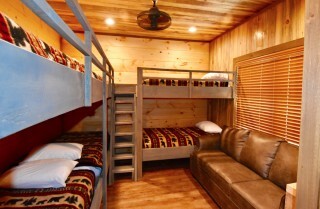 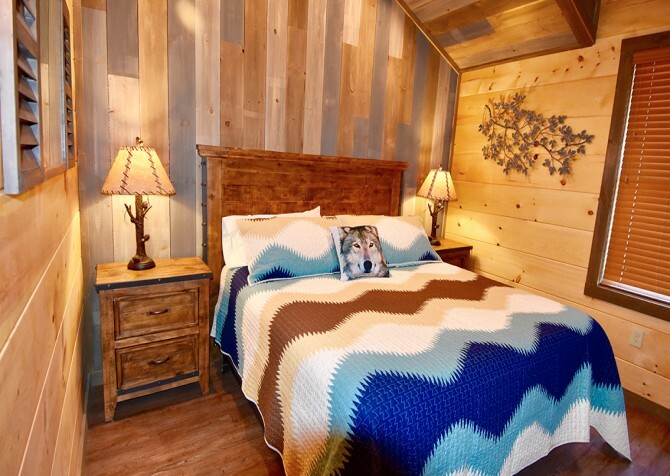 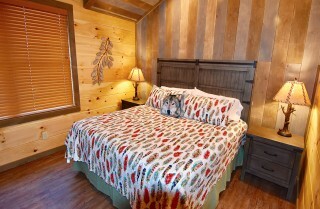 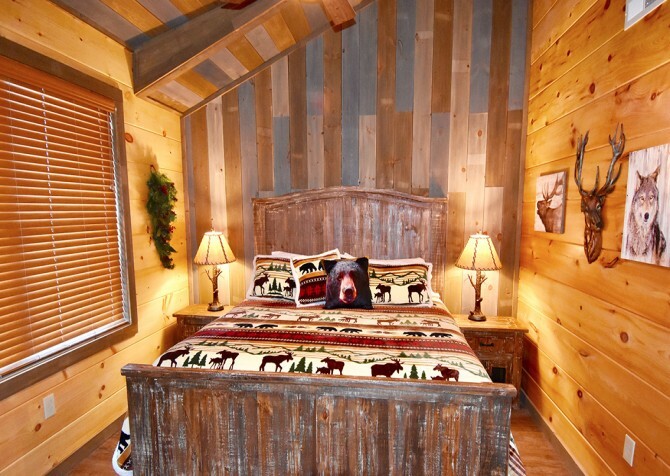 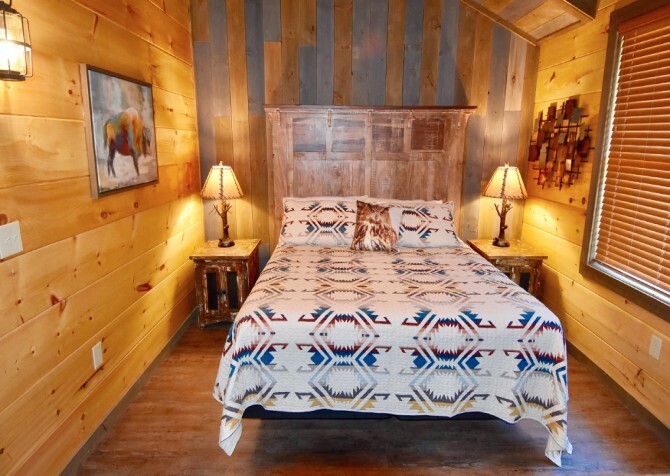 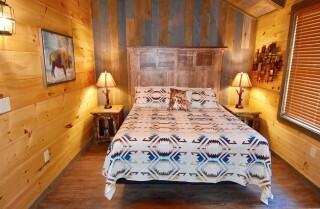 The NorthStar Mountain Lodge will feature space for 24 guests, with 5 king beds, 3 twin-over-twin bunk beds, 4 sleeper sofas - and a private bath for each bedroom. 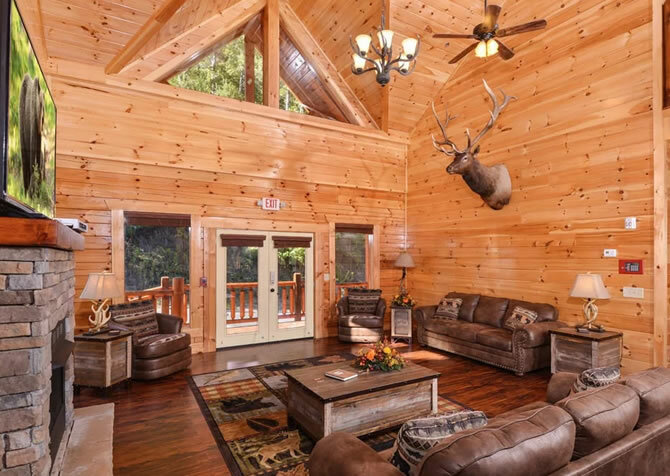 Your vacation will begin with a large, paved, flat parking area where you can unload your belongings under a covered portico. 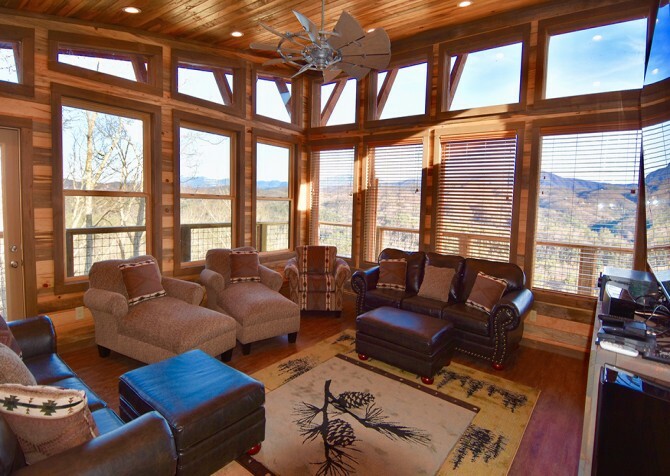 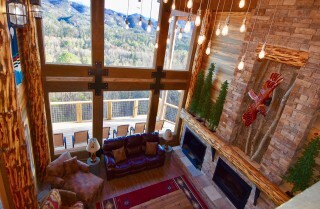 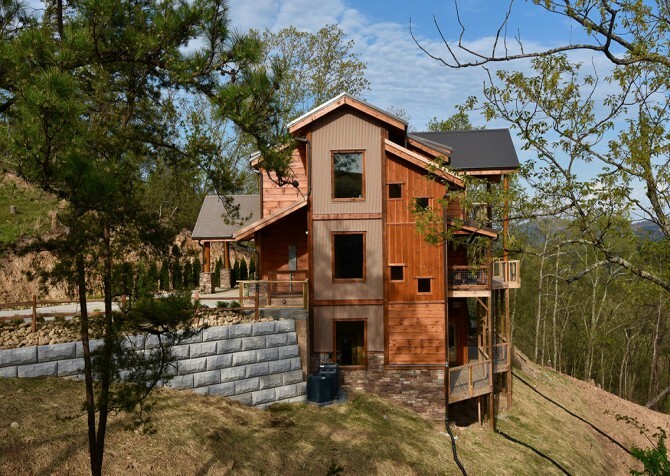 You will be met with unobscured, expansive views of the beauty of the Great Smoky Mountains extending all the way to Mt LeConte. 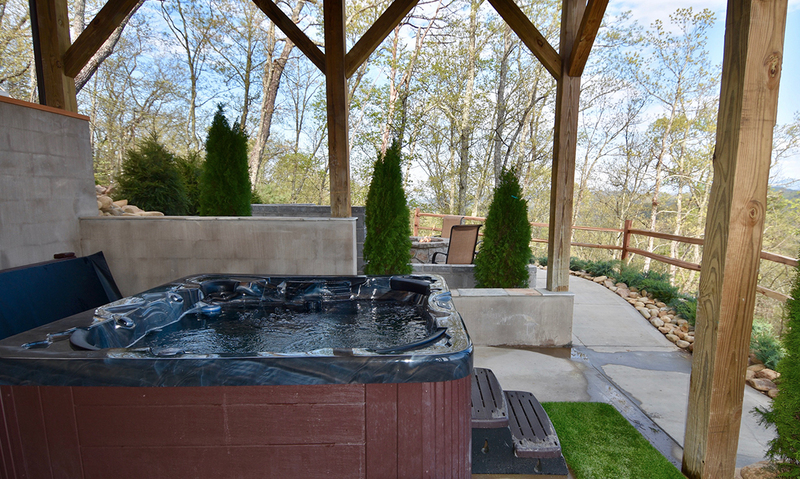 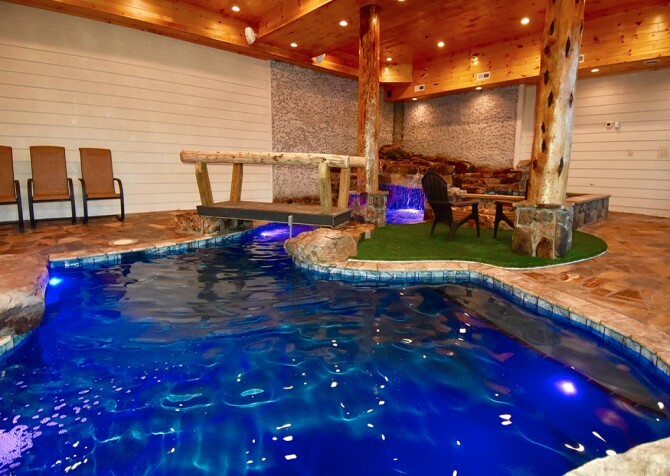 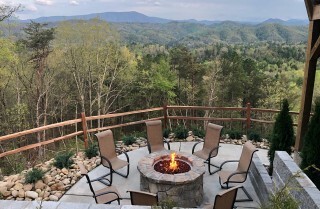 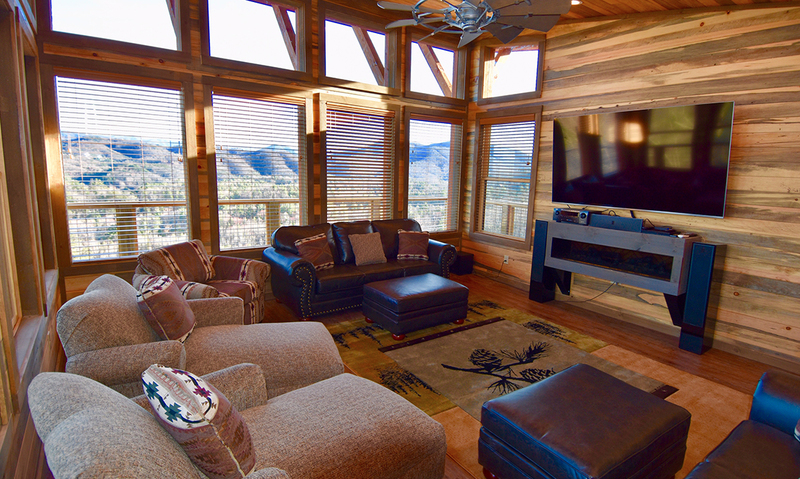 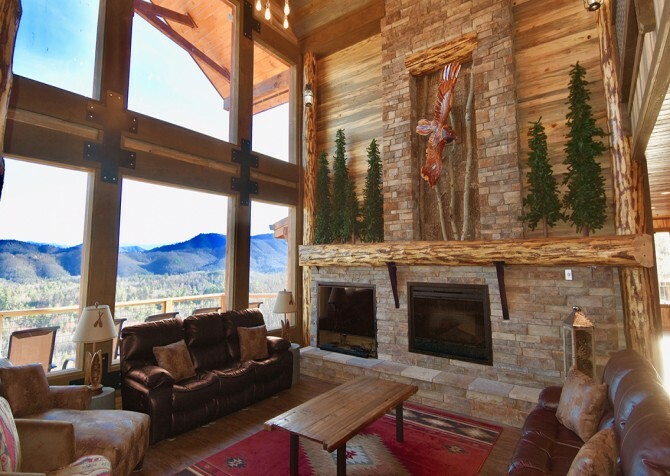 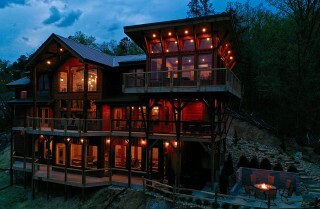 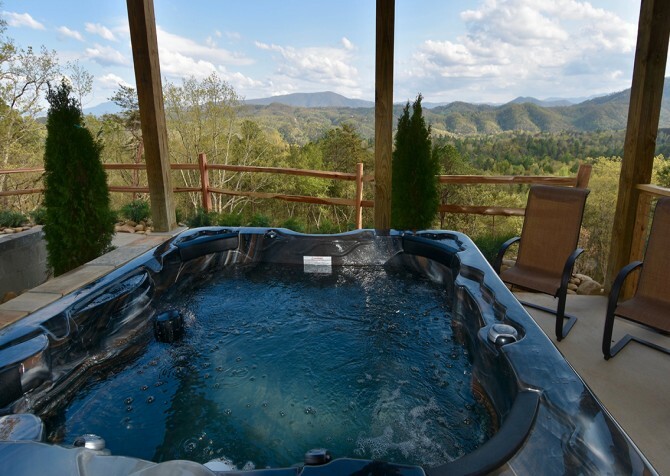 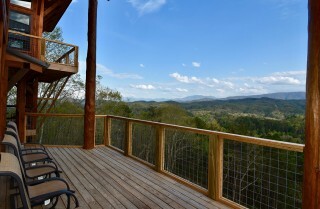 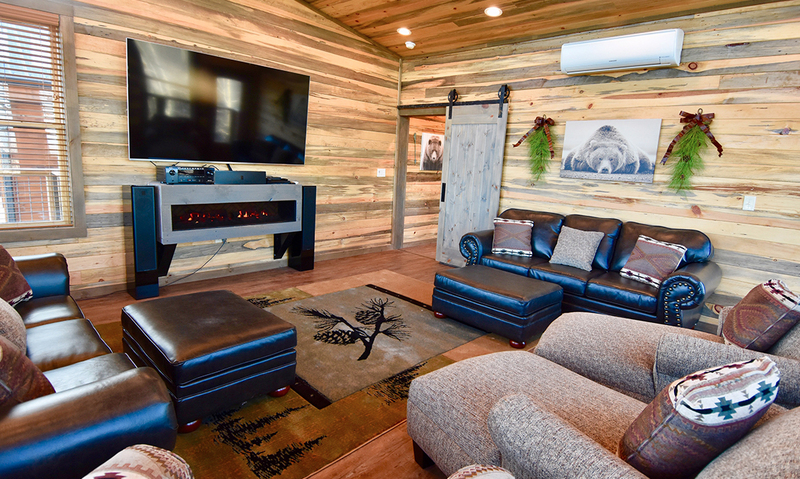 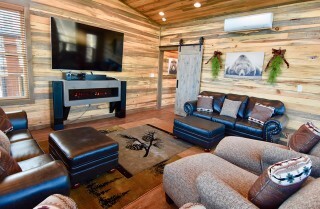 On cool mountain evenings, you will be quite cozy with 2 electric fireplaces, 1 gas fireplace, and a hot tub on the deck surrounded by the twilight settling in over the mountains. 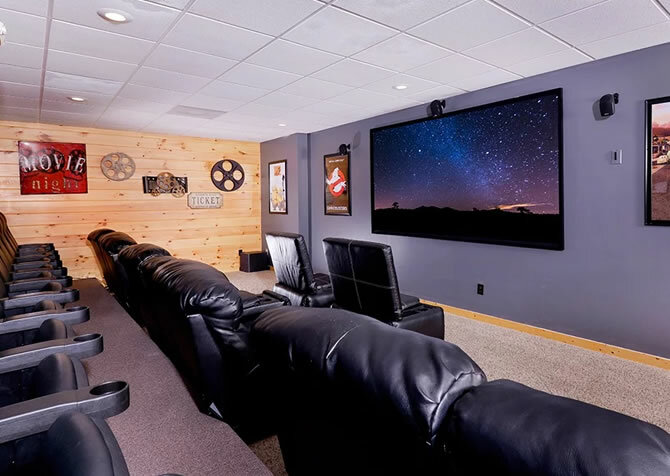 If you enjoy a good movie, bring your popcorn to the Treehouse Theatre Room, where you can enjoy the 82” big screen TV with sound system. 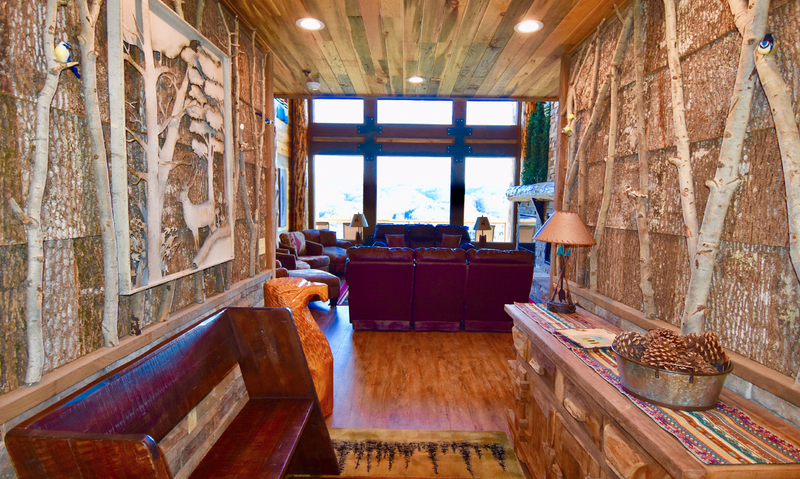 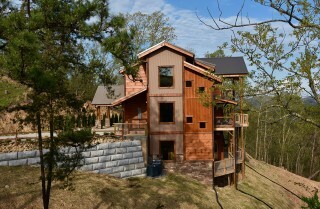 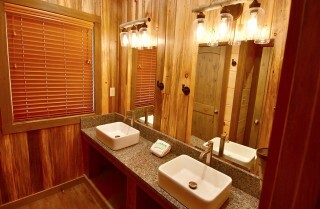 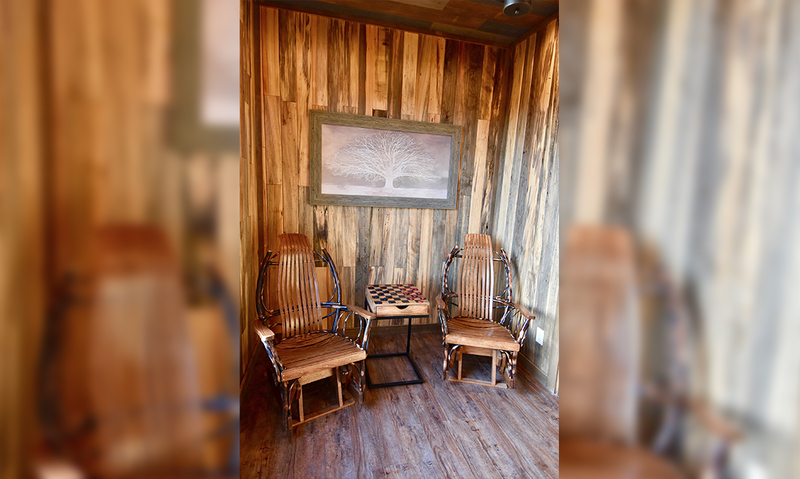 If your group needs a special meeting area, the Treehouse Room will also serve as an impressive meeting space. 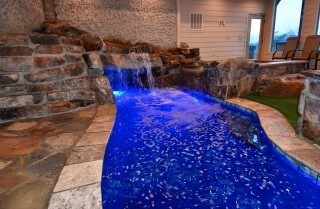 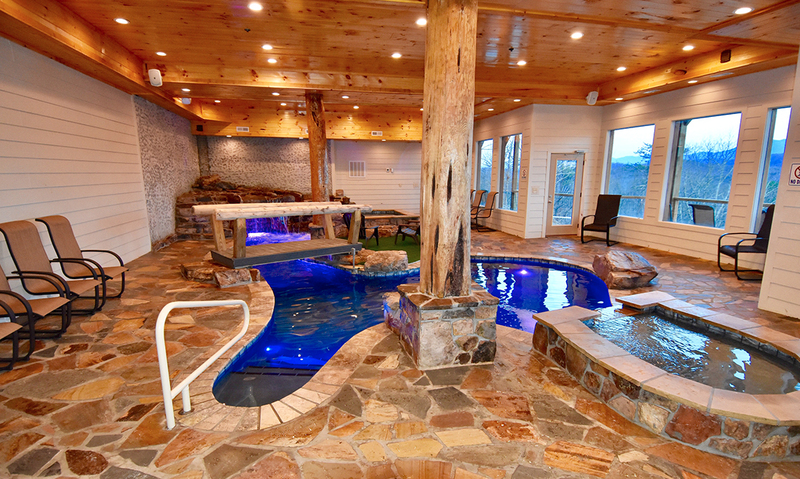 The indoor pool will provide a full resort experience. 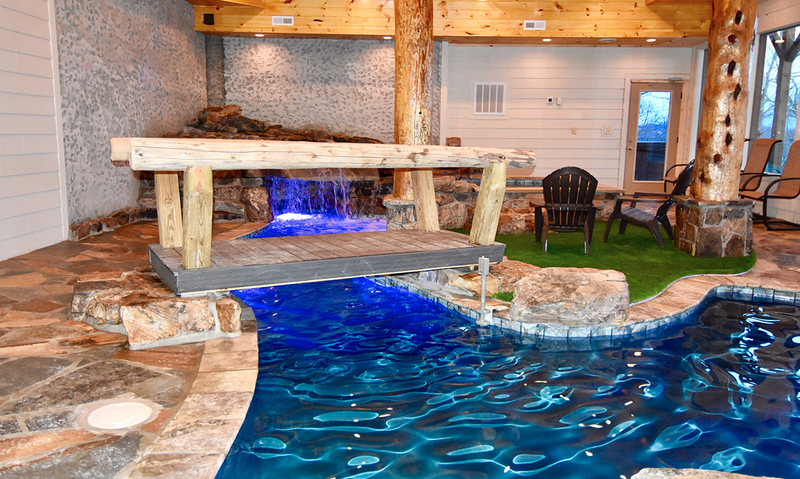 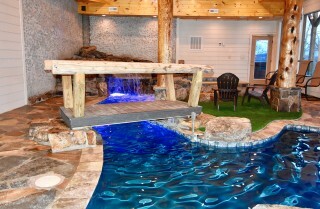 The pool will include an expansive waterfall overflowing into the swim-in grotto, the hiking bridge will take you to a grassy island where you can relax alongside the 8-person jetted spa area or to the separate kiddie wading pool. 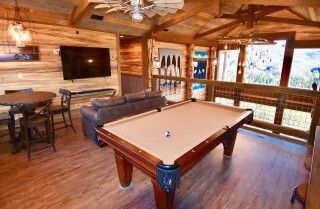 A movie and music can also be enjoyed in the pool area with a big screen TV and full surround sound system. 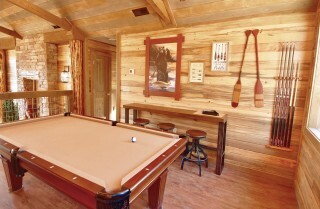 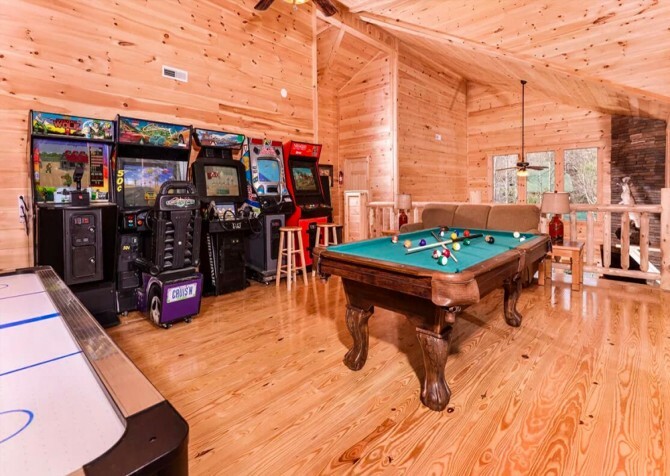 There will also be a pool table in the upstairs loft area alongside an additional big screen TV viewing area. 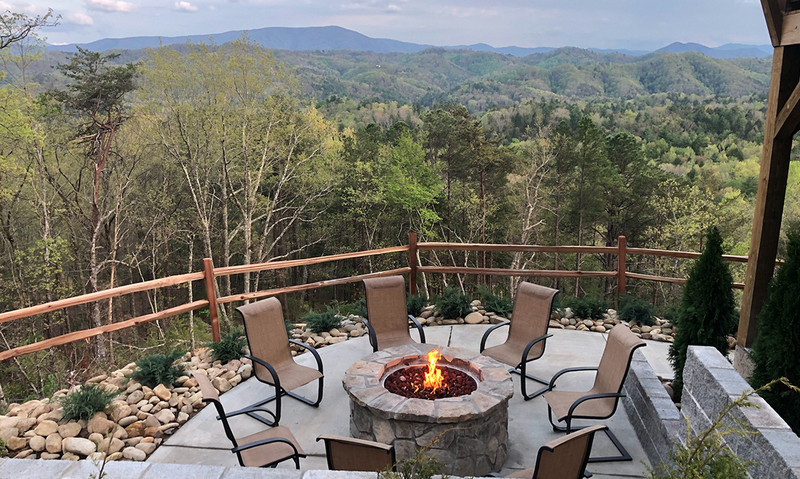 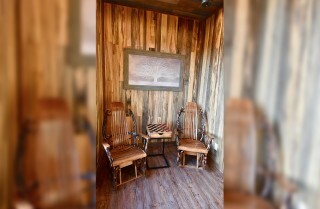 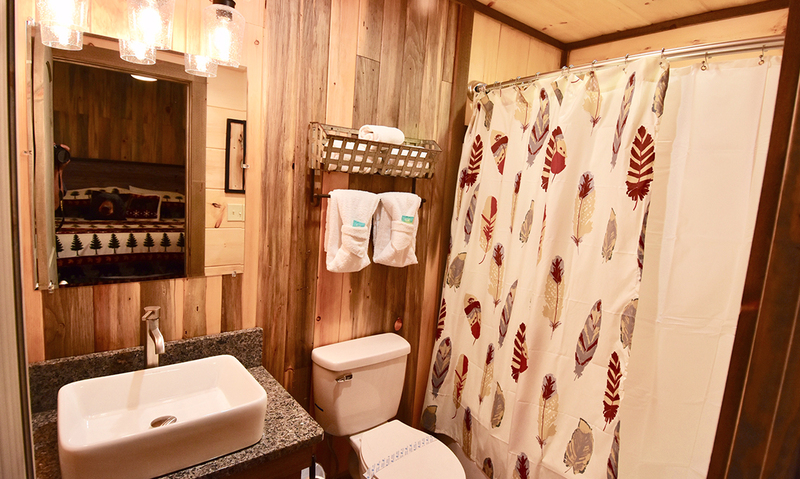 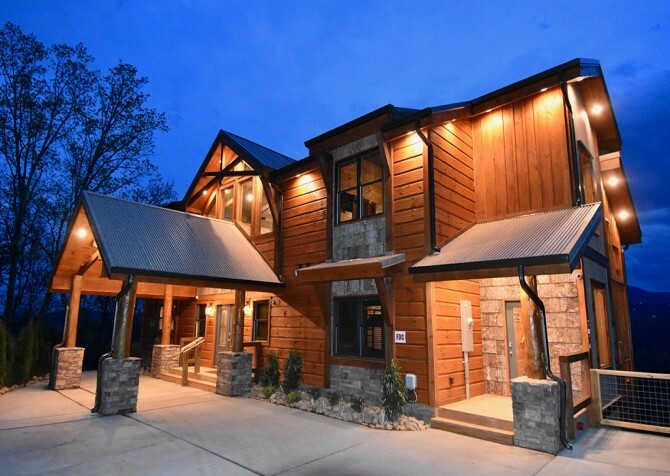 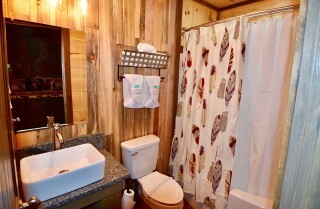 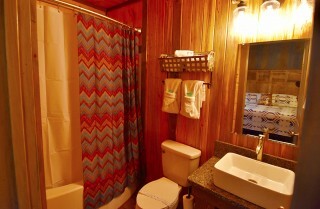 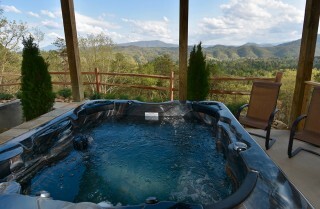 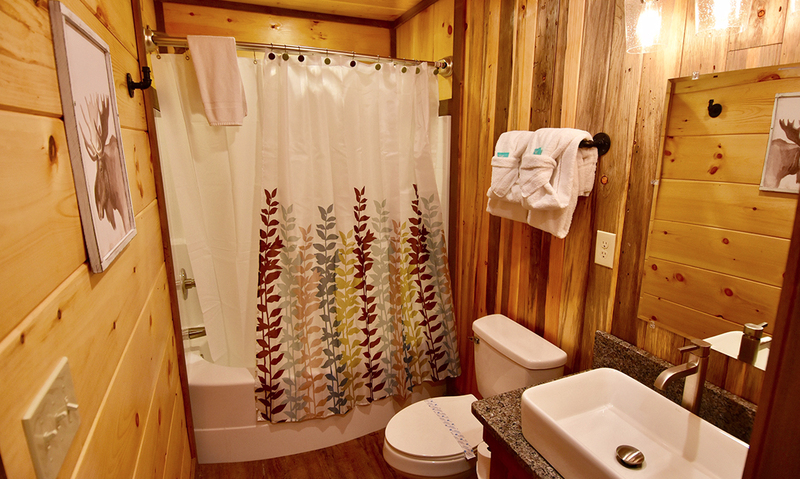 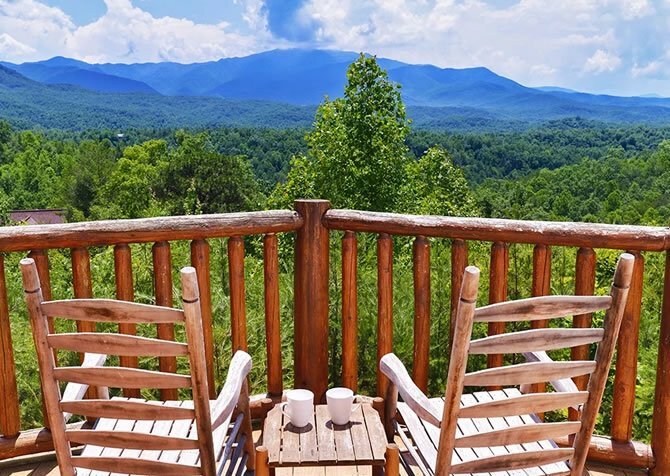 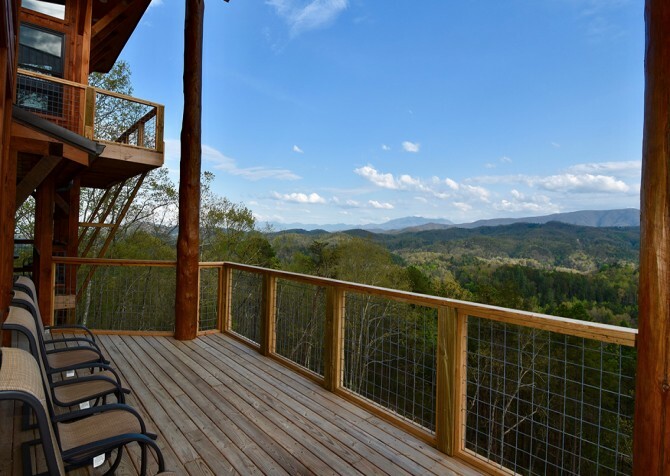 High-speed wireless internet, a washer and dryer, TVs in each bedroom, and a fully equipped double kitchen with an additional covered outdoor eating area and a dual gas/charcoal grill will complete your Smoky Mountain experience. 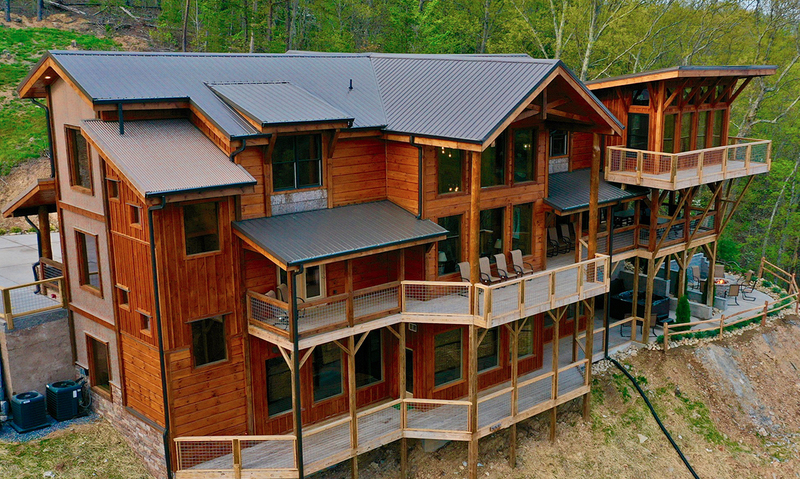 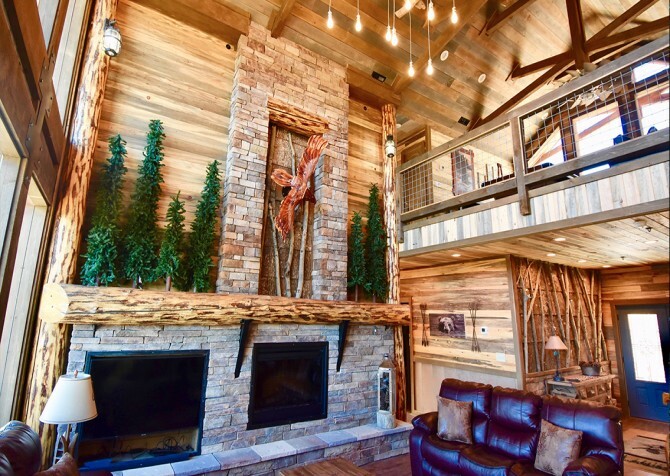 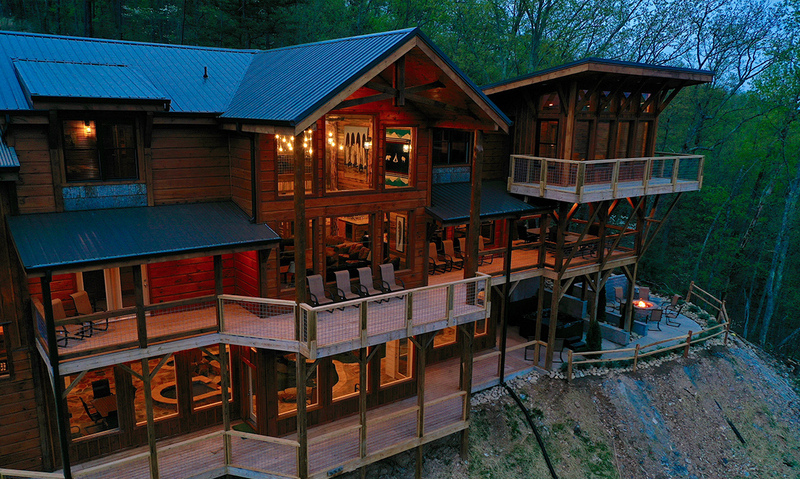 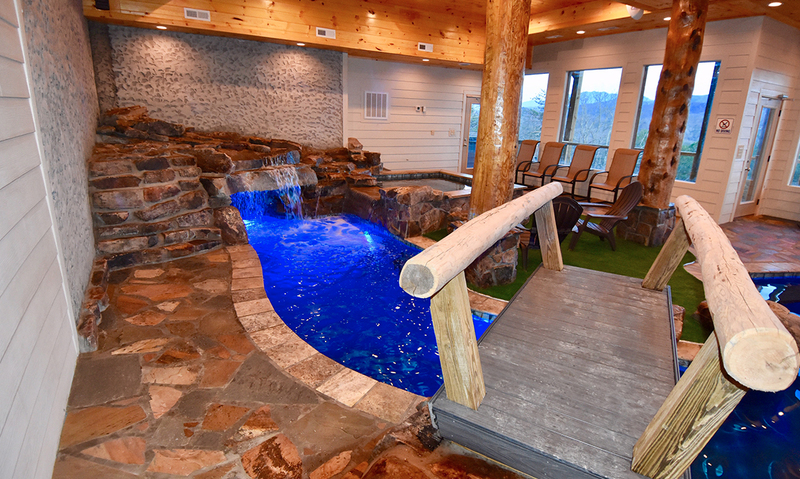 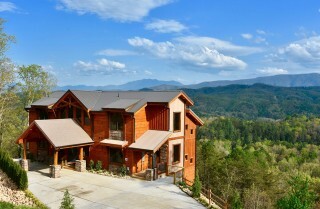 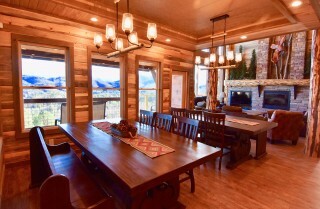 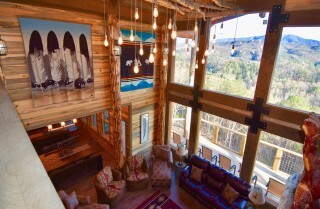 Whether you are here for a family reunion, a fun vacation, or a retreat, this brand-new mountain lodge will exceed your expectations.